Leeds United chairman Andrew Umbers. Yorkshire Evening Post chief football writer Phil Hay on Tuesday sat down with Leeds United chairman Andrew Umbers. Here is the full transcript of that interview. PH: The obvious place to start is with the six players who were declared injured towards the end of last week. Do you believe that all six were unfit to play and do you believe that they were unfit to travel? AU: I spent two hours at Thorp Arch this morning, extending the conversations I’d had on Wednesday after the Norwich game, on Thursday and on Saturday. Neil Redfearn and me get an injury list every single day. Harvey Sharman - our head physio who’s extremely good and talks to the players night and day - puts on an email exactly what’s going on. With Cani, when we signed him we knew he had a problem with his knee. He’s got tendinitis. He rang Harvey on Thursday night and said ‘the knee’s not good after training.’ Harvey said ‘come in early before training on Friday and let’s assess it.’ He assessed it and Harvey said ‘no good’. Cani went for an MRI scan this morning. With Silvestri, we all know that he got an injury against Norwich. Harvey wasn’t sure if he had chipped a bone. He wasn’t able to train last week, or what training he did he wasn’t really able to move. He was doing significant physio work and it wasn’t successful. On Thursday Harvey told us by email and by phone that he was unlikely to be able to play. He’s had an MRI scan this morning too. There’s significant bruising but no chipped bone. He’s done light training this morning but I mean gingerly training. With Bellusci, we’ve had a problem with his hamstring all season. He’s still having treatment, he’s also gone for an MRI scan and we knew on Thursday that he was injured. With Del Fabro, whether he was in the squad for Charlton or not is to be debated. But he took a very heavy knock on Thursday, reported into Harvey at 9am on Friday and said it was painful. He’s got a contusion, it’s swollen. He couldn’t play or get on the bus. With Doukara, again he’s had a groin injury all season. It’s got better but it still needs significant amount of work. Antenucci had treatment on Wednesday, treatment on Thursday and treatment on Friday. He might be back next Monday. He might be light training by Friday. More importantly, Harvey Sharman kept us all informed on Thursday and Friday so when we read what was said in the newspapers and on social media on Friday night, it was no surprise to me that these guys weren’t playing. I’ve spoken to each of them individually and collectively. Individually there’s no question in my mind that with Harvey’s expertise and our information, their injuries can be contradicted. These guys were genuinely injured. They want to wear the white shirt and play for Leeds United, whether they’re in the squad or on the periphery of it. If they’re picked, they want to play. And they’re very upset because everything has been personalised. Their loyalty has been challenged. I am satisfied that’s not the case. United head coach Neil Redfearn. PH: The owner, Massimo Cellino, said it was a “weird situation”. Silvestri’s father said he, in his words, thought it was a “silly protest” from some of the six players. Neil Redfearn said that as of Friday morning, he thought it was likely that all six would be available - and with at least four of them he was unaware of any problems. That all contradicts your version. AU: Harvey spoke to Neil firstly and he speaks to him morning, noon and night. He treats all the players. He’s frighteningly honest, he’s frighteningly good and that’s a fact. Massimo is not here anyway. PH: So when Massimo says you didn’t find out about the injuries until Friday night, that’s untrue? PH: What does it say though about the credibility of the club or public trust in the club that the assumption was that with those six players, it was a downing of tools or a collective withdrawal designed to undermine Neil Redfearn? AU: I don’t think anything is designed to undermine Neil Redfearn. Neil is first-team coach, he’s no different to John Carver, Sam Allaryce or Mark Warburton - all of whom are going to the end of the season to renegotiate their contracts. He’s no different to that. You have to remember that I’m in charge of the business side of Leeds United, not the footballing side. I want to be clear about that. AU: When you sign players, you have appearances, goals, longevity, promotion - bonuses, all four of them. We have that with almost every one of our squad; various things where on a certain amount of appearances, goals or where we’re positioned in the league, individuals get a bonus. I can think of a dozen players where it’s like that. Neil’s aware of those contractual obligations and from time-to-time we remind him of those obligations. But in no way do we - and this includes when Massimo’s here - tell him who to put out on a Saturday or a Tuesday night. AU: Mirco Antenucci is contracted to Leeds United for next year. What we do with Mirco and his contract is between us. We want him to stay because we think he’s a fantastic striker who’s got better and better as he’s got more used to the Championship - and though the coaching of Neil Redfearn. 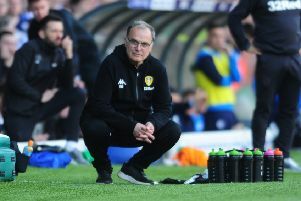 PH: If Neil Redfearn is not going to be head coach next season, what has the club done to look for a replacement - given that the season ends in 10 days’ time and the transfer window opens soon? PH: So the idea that Neil Redfearn is as good as gone, the assumption that he’ll lose his job in the summer - you’re saying that’s wrong? PH: The four young players who’ve been a shining light this season - Cook, Mowatt, Taylor, Byram - have contracts been offered to those players? AU: At Cagliari Massimo Cellino built one of the youngest sides in Serie A. When Massimo came and bought Leeds United and sat down with everyone from Terry Potter, Steve Holmes, Andy Wood and Neil Redfearn to talk about the academy - about the under-15s, under-16s, the 21s - we made it a policy to play them. If they’re good enough, play them because we’re going to back you. Leeds United do not want to lose any of these young players. Leeds United will not lose any of these young players. AU: I’m just aware of what we’re doing and what’s going on. I can’t tell you everything but I can tell you that one or two of these things were sorted out months ago. The fans can be assured - and they’ll judge me on my word - that you’ll see not only those young players but an improved squad by the start of next season. AU: He’s been in Miami for two to three months. You should ask the staff who’s been running the business and they’ll probably give you a different answer to what you think. On the football side it’s been run by Neil Redfearn. On the business side it’s been run by me. The staff have, I think, enjoyed the three months - or everything up to the last week. Of course Massimo’s watching what’s going on. AU: I’ll answer that in a different way. He doesn’t want to sell the club and contrary to rumour, I’m not here to sell the club either. I’m here to manage it. I’m a Leeds fan, albeit people might find that slightly ironic, but I am. I’m here to make some hard decisions which benefit the club in the short, the medium and the longer term. There are always people who are interested in buying Leeds United, as there are with every football club. You just have to read about Aston Villa and others who are perceived to have an issue at the top. Massimo is not for selling, I’ve said it before. He’s not for selling but if you’re looking at a house that’s worth a pound and someone offers you four, you might be interested. But in football there’s so much noise. There’s nothing in reality which actually catches you. Has he spoken about it? People have got his phone number. I can’t stop them ringing him. But if we’ve ever talked about things like that in Miami, he’s made a commitment to live in Leeds. He’s made a commitment to put his children in Leeds. His wife came over. You don’t make those decisions and then just walk away. As the fans will probably gather from some his comments, he’s pretty colourful in the way he responds to that type of question. He’s made unpopular decisions. He’s already made many. But underlying, I think you’ve got a good steward of the club - someone who knows how to sort the mess out and build the footballing side. PH: With regards to his future as owner, a question that’s important to ask - in his time as owner or your time on the board, has any third party or potential buyer of the club performed due diligence on the club’s accounts?